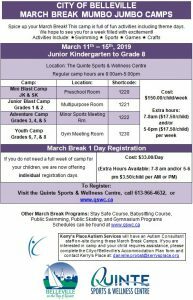 MARCH BREAK MUMBO JUMBO CAMPS - Spice up your March Break! This camp is full of fun activities including theme days. We hope to see you for a week filled with swimming, sports, games and crafts. 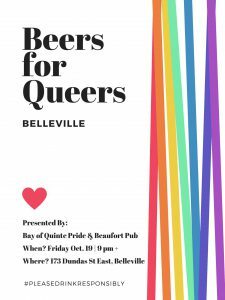 BEERS FOR QUEERS - On the third Friday of every month, join the members of the Bay of Quinte PRIDE at Beers for Queers at the Beaufort Pub. 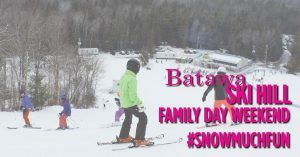 LEARN TO LOVE WINTER SATURDAY Feb. 16 - Enjoy the great outdoors and learn how to ski this Family Day Weekend with the second Learn to Love Winter Saturday at Batawa Ski Hill. 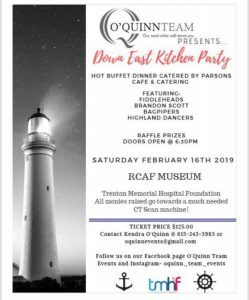 KITCHEN PARTY FUNDRAISER Feb. 16 - Join us for an evening of East Coast music, entertainment and hot dinner, all in support of the Trenton Memorial Hospital Foundation. Frink Centre, 381 Thrasher Rd. 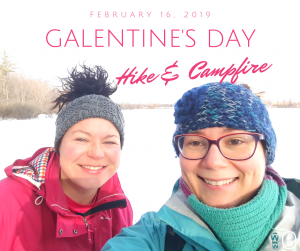 GALENTINE'S DAY HIKE Feb. 16 - Join Women Hike Wild as they explore the trails around the H.R. Frink Centre at night! Snuggle up around a campfire with a cup of foraged tea and a treat! JULIA FINNEGAN LIVE AT CAPERS Feb. 16 - Her songs are well-crafted, poignant, and thoughtful, with melodies that are both captivating and memorable. 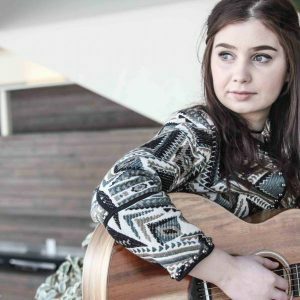 Catch Julia Finnegan live at Capers in downtown Belleville.